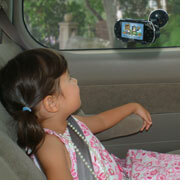 Arkon offers the most extensive line of car mounting solutions for Playstation, Sony PSP and Tomtom GO 300, 500, 700 GPS . With a variety of car mounts and holders to choose from, you can display your SONY PSP for optimal viewing from any number of positions throughout the car. Ideal for use with portable GPS devices that use Arkon's Dual T slot pattern like All Magellan RoadMate etc Innovative design allows you to remove top portion of the mount, thereby leaving just the adhesive base on the dash. This feature may help prevent theft as your device is not readily visible. The back of the cradle features Arkon's Dual T Slot mounting pattern thereby making this entire family of products compatible with any of Arkon's Dual T Tab pedestals.